It's time for another Going Grey Challenge at Srcap-Creations. This week *Wink*Wink Ink is Sponsoring the Going Grey Challenge. The Designers all selected images from *Wink*Wink Ink to use for today's post. I used the cute Sleepyhead image, printing the image on Watercolor paper, then quickly embossed with Black EP. To add color, I used the Marker Water Coloring Technique, then sponged the edges in Old Paper Distress Ink. The background quilt blocks are created using Basic Grey Marrakech, I cut the squares, layered them on a piece of card stock, then cut with the Top Note Die. The stitching is a Stitch and Labels set from StarvingArtistamps. The sentiment is from Kitchen Sink Stamps (Baby - Multi Step Baby; for - Never a Loss 4 Words). To give the quilt the worn out look, I ran the it through the Distrezz-it-All to rough up the edges a bit. Thanks for stopping by, be sure to check out the other Team members creations this week and join us for this weeks challenge at Going Grey with Scrap-Creations. One random winner from this weeks entries will win 3 FREE Digital images from this weeks Sponsor *Wink*Wink Ink. Adorable! Cute image and lovely layout! 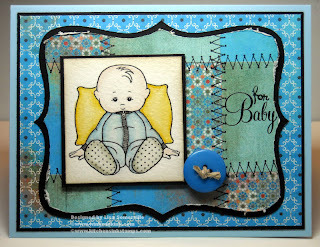 OOO Lisa love this design and your use of the topnote..That baby is toooooo cute and what fabulous papers!!!! ADORABLE card! The patchwork on this card is amazing. I can never get mine to come out like this. Great job!! Lisa--that little boy is super cute! Love the whole card:) TFS! This is FABULOUS Lisa! And your coloring is AWESOME!! Love what you've done with our little "sleepyhead" ... FANTASTIC!! So adorable!! The patchwork is just amazing! Lisa another beautiful creation...love all the monochromatic hues of blue...nice touch with this stamp...wink..wink.. I love everything about your card! That image is so cute and goes perfectly with the layout and stitching on the card. I also love your choice of BG paper this week! So glad you decided to play along again with us! Love these colors - great background and beautiful Baby card, Lisa! Lovely quilt behind your sweet baby image! Love the bright colors you used on this! Super cute card, love the quilting with the baby, so perfect. So glad you joined us again this week! Lisa, this card is adorable....I Love the patchwork. Fabulous job with the challenge. Thank you for joining us and you know you are always welcome at Going Grey!